We’d love your help. Let us know what’s wrong with this preview of Tick Tock by Rahul P Bhandare. Ultimately, life just goes on. Here's a story of a writer watch that closely depicts the chaos of our own lives. Told only through images, this immersive tale holds a profound message. To ask other readers questions about Tick Tock, please sign up. Tick Tock by Rahul P Bhandare is a comic book. It’s a story of wrist watch which kept changing hands until it became unique. The concept of the book is amazing. It’s a unique book full of images telling a story. It was like reliving the childhood where we have to make a story from the given picture. This book is like one of them. The author tried to tell the story in a unique way with pictures and it indeed touched my heart. There’s so much to learn from this 27 pages book. It tells about the chaos Tick Tock by Rahul P Bhandare is a comic book. It’s a story of wrist watch which kept changing hands until it became unique. There’s so much to learn from this 27 pages book. It tells about the chaos that we have in our day to day lives. The author conveyed the message of Life goes on! in a different and wonderful way. It will change your way of thinking. The few pictures had a huge impact on me. The author tried to show us the reality through pictures. Tick Tock by Rahul Bhandare is a graphic novel which speaks a lot in a few scribbled images. The story is about a wristwatch and its journey from its assembly in a factory. From factory, it goes to a showroom, then to a buyer and finally its fate. There are no words in the book, yet it will tell you a wonderful story about the life. Very complicated things about life is explained with very simple black and white sketches. The book will take just 10-15 minutes of your life to explain the purpose Tick Tock by Rahul Bhandare is a graphic novel which speaks a lot in a few scribbled images. 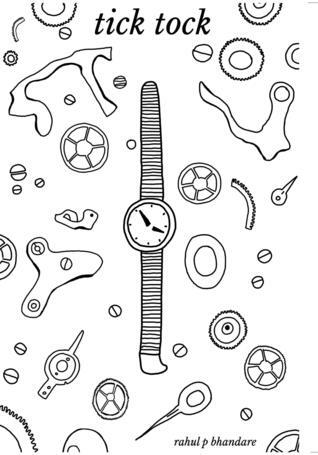 The story is about a wristwatch and its journey from its assembly in a factory. From factory, it goes to a showroom, then to a buyer and finally its fate. There are no words in the book, yet it will tell you a wonderful story about the life. Very complicated things about life is explained with very simple black and white sketches. The book will take just 10-15 minutes of your life to explain the purpose of your life. his is a very first time that I am Reviewing a comic book. When I agreed to review the book ‘Tick Tock’ I had no idea that this book is going to be different from other books. So obviously I was in for a surprise. This an interesting tale of a wristwatch from the movement of being assembled to exchanging hands of different people. And the twist at the end literally blew my mind. Amazing is the only word that comes to my mind for this wordless tale ‘Tick Tock’. The whole story is told in illustrati his is a very first time that I am Reviewing a comic book. When I agreed to review the book ‘Tick Tock’ I had no idea that this book is going to be different from other books. So obviously I was in for a surprise. Amazing is the only word that comes to my mind for this wordless tale ‘Tick Tock’. The whole story is told in illustrations/images form. It took no time for me to read this book. Rahul’s ‘Tick Tock’ left a huge impact on me. I realized that only words are not mightier than swords even pictures have the power to cut through your heart. And as Author said “Here’s a story of a wristwatch that closely depicts the chaos of our own lives, This immersive tale has a profound message. A book with no words and a few images tells a lot that many books can't tell you in thousands of words. This is not one of those comic books you've read in your childhood, but it's one of those books you need to read and remember for the lifetime. The illustration of the journey of a wrist watch from the factory to the different people who wears it comprises a profound message. It will make you understand the purpose of life and take very little time. It's one of the 'must-have-books', no matter o A book with no words and a few images tells a lot that many books can't tell you in thousands of words. This is not one of those comic books you've read in your childhood, but it's one of those books you need to read and remember for the lifetime. The Plot: The journey of a wrist watch, through time. From being assembled, to changing multiple hands, and owners, to a whole new twist in the end. This wordless journey is depicted through illustrations / images. When I was asked if I would review a Comic Book, I was a bit taken back. I tried to think back to the last time I had read one, and only Archie’s comics came to mind. My curiosity about the comic book led me to accepting the review offer. As soon as the slim, black and white illustrated copy of Tick Tock by Rahul P Bhandare was in my hands, I read it in one go. I must confess I have read it many times over ever since, and each time I read it, I interpret it differently. With no words being used to tell the story, your imagination is free to take flight, as it follows the simple illustrations. I found the concept of a wordless story very intriguing, and each time I read it, I interpreted it according to the mood I was in. If I was low, I found a philosophical story. A happy mood brought about a cheerful outcome. A refreshing concept and a simple story make Tick Tock by Rahul P Bhandare a must read. Rahul P Bhandare is an Engineer by profession and worked at Godrej, till his creative side pulled him over to Advertising. It is a comic book which depicts the life story of a watch through pictures and illustrations. The pages of the book may be less but the meaning it conveys is deep which many books with more than even hundred pages fail to deliver. The journey of the watch from a life full of hardships to at last achieving something big gives out an important lesson to the mankind. In our life we have to go "Don't watch the clock; do what it does. Keep Going." It is a comic book which depicts the life story of a watch through pictures and illustrations. The pages of the book may be less but the meaning it conveys is deep which many books with more than even hundred pages fail to deliver. The journey of the watch from a life full of hardships to at last achieving something big gives out an important lesson to the mankind. In our life we have to go through several difficult situations but instead of being heartbroken we should keep going because at the end our perseverance will lead us to success and maybe an extraordinary one. A person should not be judged because of his current situation as everything comes to us at the right time. Many people will come and go, some will use us some will break us but instead of relying on others we should push ourselves on the path life takes us because we don’t die if we fall in water but we die only if we don’t swim. Great things take time and so we should never give up. My Opinion: Even when I wasn't able to read, from that time I had picked up comic books. They are so close to my heart. This is one of the comics I recently read & loved. The book follows a journey of a tiny watch & how it reaches from one place to another. The first thing is the book has no words, only illustrations & I am sure for the illustration artist & the author it has been very difficult to coney such a deep message without even using a single word. I liked it much appreciate the efforts taken behind. It's a very short book of about 20 pages or so & even a kid can read it. The cover is cool & the title is apt for the content. Pros: This book can be read by anyone, so there is no age limit. The illustrations were amazing no doubt. The message was conveyed very well. It's a 5 minutes read. So everyone should try it once. I do recommend it & I am willing to read more such books from the author. Cons: I wish the book was bit longer because it felt too too short, but it was cool & enjoyable. This book is a gem. It's well thought, tact, precise and a story well told. For any are group and I repeat, a very important at that one- Everyone should go through the authors mindset which makes one smile, think and retain the moral of the story. The story is short but something which goes like this- Time which changes hands, destinies, wanders around mortals with a forgotten immortality of being. A story told through a unique characterization of a watch whose tick tocks penetrate your thought process for you to realize that how even a thousand pages couldn't do justice to a few somber faces of a gambler, a couple, a watch Maker. Do BUY this and gift it to everyone you know if you want to touch hearts without wasting time or money! First things first, I love this book! This book is an example how minimalistic things can have a huge impact on us! This book depicts a pictorial journey of a wristwatch. It's kept changing hands until it reaches it's destination. It is one of the unique book I've come across. I am fan of the idea 'less is more' and this work is a great example of that. With just few pages, it had a huge impact on me. This book will teach you that by judging the journey you can't tell where a person will reach in the end. And we face each obstacle but the life goes on! Everything is happening for greater good. This book is filled with optimism and warmth. It will make you smile and fill you with motivation. I love the cover and the presentation of the book. For people who don't need words to understand the story. Tick tock is a small visual comic written by Rahul P Bhandare In less then 30 pages, this short comic which comprises of visuals and no dialogues, and still it manages to convey important message of motivation, self worth and going with the flow. I loved the simplicity and easy of reading that this book gave me and I couldn't keep my hands off it moment I opened my package. It even got my non-reader sister interested as she finished it in o For people who don't need words to understand the story. Sometimes some little things convey way lot more than sentences and paragraphs could do. And this is one such book. Its a story of a watch. The watch reaches its true destination in its own time. Its a simple comic with a big meaning, the chota packet bada dhamaka kind. Its not always I rate a book five on five. I rate this book five on five because in just 26 pages it teaches us the big lesson. For me it was everything happen in its own time. And also that to reach to the rose one has to climb on the Sometimes some little things convey way lot more than sentences and paragraphs could do. And this is one such book. And also that to reach to the rose one has to climb on the thorns. And at the end of the day its worth it. The concept is amazing and unique. Despite being a comic book it doesn’t seem like the ones we usually have come across. The book has an underneath morality stream. The reader’s perspective changes a lot. The pictures and illustrations are beautifully drawn. After going through this book one might never think of giving up.